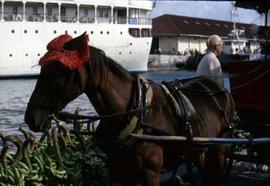 Colour Kodachrome 35mm slide depicts a horse and carriage. The horse has a red hat on and is standing next to bananas. There is a ship in the background.